Phoenix Virtual Tours,Real Estate Photography,Virtual Tour Photography in Phoenix,Scottsdale,Mesa,Chandler,Gilbert,Valleywide!Desert360.com! We are your preferred choice for High Quality,High Value Virtual Tours and Photography! 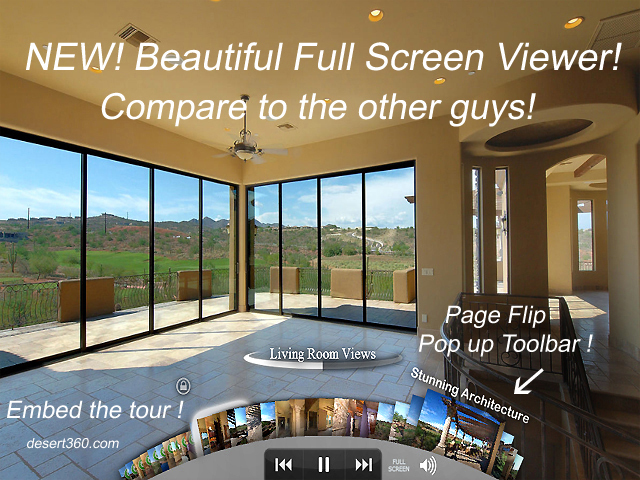 Please view our ALL NEW FULL SCREEN Virtual Tour Viewer below, that blows away the competition! Give Buyers and Sellers a stunning Visual Experience for your properties!Your BEST value in Phoenix. Desert360.com Virtual Tours, Photographers for Real Estate and Video Tours.360 Virtual Tours in Arizona,Real Estate Virtual Tours in Phoenix,PHOENIX VIRTUAL TOUR PROVIDERS!,Mesa 360 Virtual Tours,Scottsdale 360 Virtual Tours,Chandler Virtual Tours,Paradise Valley 360 Virtual Tours,Cave Creek 360 Virtual Tours,Ahwatukee 360 Virtual Tours,Ahwatukee,Tempe 360 Virtual Tours,Maricopa 360 Virtual Tours,Queen Creek 360 Virtual Tours,Avondale 360 Virtual Tours,Valleywide! 480-656-4995 We are a recognized leader for Professional, Affordable Real Estate Photography and 360 Virtual Tours for the Phoenix Valley! Read More about us below. Virtual Tours Phoenix, Hi-Def Panorama Real Estate Virtual Tours Scottsdale,Desert360.com Virtual Tours and Video Tours for Phoenix,Scottsdale,Mesa,Chandler,Gilbert,and surrounding areas. It is essential to give your listings maximum exposure. Over 80% of homebuyers now use the internet in their property searches and their first impressions come from what they see online. If your listings appear dark, fuzzy, and unappealing, you may be losing buyers without even knowing it, because they may never call you to take that second look! Click on our logo above for home page ! Now offering affordable Video Tours for YouTube or Pro quality Video Tours using professional equipment.We have 25+ years experience in photography and Video production! Desert360.com is your smart choice for professional and affordable photography! We provide highest quality stitched panoramas, with a ultra wide non fisheye, digital SLR field of view ! We offer next generation hi-definition FULL SCREEN 360 Virtual Tour solutions! With over 27 years experience in professional photography, video, and digital editing, we will make your real estate 360 Virtual Tours look their very best. If you need a Virtual Tour, Commercial or Business Photography, Desert 360 Virtual Tours is your best choice! We are local, independent, and family owned! Every photograph and 360 Panorama we shoot is individually inspected and processed thru high-powered software, to provide the best possible image, and the best possible first impression! Consistent, HIGH Quality is our goal , not HIGH volume. View our Samples. We do have lock box access as well, and you can count on Desert 360 Virtual Tours to photograph your listings when you are too busy to be there. Our customer service department will answer your questions, schedule your virtual tours, and make sure that you will want to come back- again and again. We offer Valley wide service. Call us today! Or, simply order a tour online. Come back often to view our revolving homepage slideshow for crazy specials, new products, and updates! Make a local call to Desert 360 Virtual Tours today. You will be glad that you did ! Bulk Tour & Team pricing as well! Make sure to bookmark us !